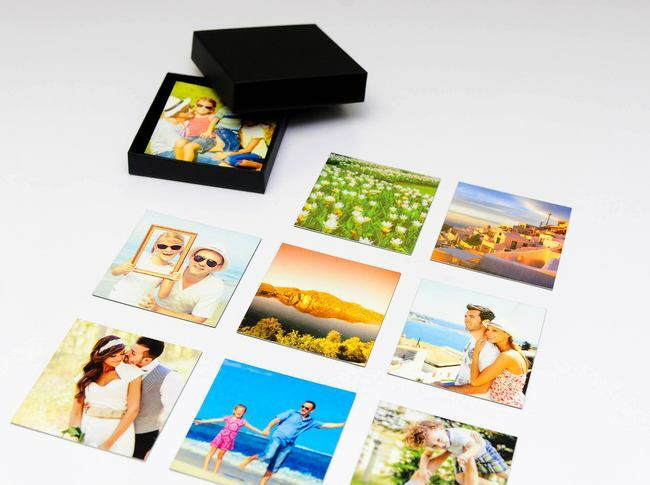 Create your own montage of precious memories with a selection of photo magnets, each customised with your choice of images. From your fridge or freezer to your iMac, these magnets look great in the home. Why not purchase a magnetic board and create your own personalised display of photo memories, such as an anniversary or honeymoon, to give as a unique gift or to brighten up an area of your home? 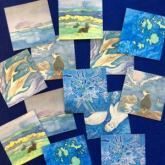 If you want to make a fun and distinctive creation, you can opt for a single photo that will be split into nine magnets for a customised jigsaw puzzle – a great present for kids to have fun putting back together. Alternatively, you can add text to your design to create a unique ‘save the date’ message for your wedding or to announce the arrival of your baby. There are numerous options to make these magnets personal to you. With a choice of two sizes available, each set of nine magnets arrives in a gift box and serves as the perfect present for any friend or family member. 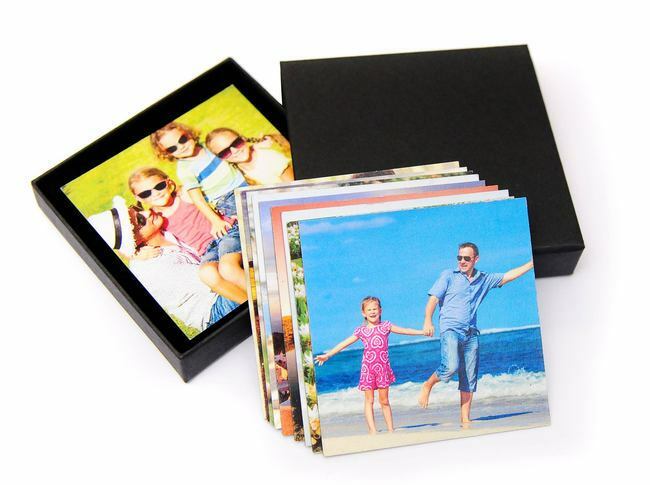 You could create a themed selection that capture a memorable holiday or pick varied snapshots of your loved ones for a special birthday – there are countless options for ways to tailor this fantastic gift idea. These customised magnets make lovely keepsakes to dot around the home or the office, to liven up filing cabinets with photos from the work Christmas party, or to use as wedding favours. Perfect magnets to put over your fridge to brighten up your kitchen ???? Beautiful magnets,the photos on them were very clear. Fast delivery, price was very reasonable,I will definitely buy from them again. Great product, really happy with the outcome! Product was great, really happy with the outcome! Didn’t take long to arrive and was a great product for a present. Really like them, will buy more again. Website was so straight forward and easy to use. I ordered some prints to be put on magnets cannot recommend more highly. Also going to order much more. Reasonable price also!! This is my now go to for gifts. Really happy with product. Extremely pleased with service & delivery of items. The best photo magnets I’ve stubbled across. My fridge is full of smiling faces. Adorable magnets with very clear images. Didn’t think the photo quality would be as good as it is, very pleased will make a lovely gift. Really great quality, I’ve had photo magnets before but these are much better in terms of quality and they were cheaper. They were beautifully packaged too, I didn’t want to throw the box! Because they’re products are fab! Easy to navigate and upload via the website, regular updates and quick delivery. I would ask for maybe cheaper postage but that’s it. The packaging is slimline and clean and looks very professional and exclusive! First order - 5star product!! So happy with my order, we have now been ordering for over a year and every order has been faultless. The simplicity of the packaging is classy and unique. Fantastic product with super quick postage! Really pleased with my first order. Very good quality, lovely little box they come in. Super quick postage. Liked it so much I’ve just placed another order with you! Well printed,fast service. Could be thicker to look better quality. These personallised fridge magnets are prefect as a christmas stocking gift. I can't wait for my mum to open them. Arrived promptly and brilliant quality as always. The packaging is a bit much. It does a great job of protecting the magnets, but I am trying to think of a way for me to reuse the box and why not use paper rather than plastic to wrap the magnets in the box? Good quality magnets presented really nicely. My customers really love my magnets. My silk paintings look great on them. Arrived promptly, well packed and good quality. Very good quality magnets, a little small I like the 8 by 8 size better. The Magnets are very good. Amazing product, better quality than expected! I bought 9 fridge magnets for fathers day, and they were great quality and came quickly! Can't fault pixa prints at all. Really delighted with the product every time I have ordered from Pixar prints. The turn around and delivery timing is great every time I use the service and the product is excellent quality. really pleased with the quality of print for my uploaded images. The magnets came really quickly in lovely packaging and the standard of finish is very good. They look great on the fridge! These were a gift for my mum and she loves them, great gift - she now wants more! Ordered these as a gift for my mum and they're just perfect. Really easy to design and the final product is really nice and well Packaged! Would order again! I love these magnets, the photos came out so clear & they came packaged in a lovely box which would be perfect if you were giving these as a gift. Overall extremely happy. I’m getting addicted to this !! Great concept my friends loved them!! This was a present for someone so I was pleasantly surprised with the lovely presentation and great quality. Thank you. Review by: Miss Claire H.
Really good quality and arrived quickly. What a brilliant way to keep memories alive. The magnets are good quality and the photos I chose make me smile every time I go to the fridge. I ordered the fridge magnets with 9 pictures on for my mother for mother’s day! There was a picture of all of her children, grandchildren, and one each of her sister, mum and dad who she unfortunately lost last year all at the same time. May I say, when she received them, she cried her eyes out. However these were happy tears, and she couldn’t believe how I thought of such a unique present for her. So Pixa Prints, I thank you. You made my mum very happy, and the quality of all prints was fantastic, except for one, (however that was my fault because the photo I used wasn’t very good)! Deffinatly be ordering again! Very easy design process. Quick delivery and excellent price. Very happy! Excellent service delivery. Packaged lovely. One of my magnets didn't have a photo on it whuch was a bit of a disappointmen. I loved it fast delivery beautiful and quality recommend. Quality and speed of delivery exceeded my expectations. Would definitely recommend to friends and order from Pixa again. Thank you! Still covering my fridge in these great magnets, so colourful! Can't fault at all.....Fast, professional, service!! My daughter loves that there's now photo's of us on our fridge! Brilliant finish to the magnets. They are a super size and went down really well as a gift, great value for money. I recently purchased some fridge magnets. I was really happy with the product and made a fabulous present. They arrived very quickly and the service was easy to use. Fast efficient service. Bought as a gift so arrived in a lovely presentation box. Good magnets good size. Picture quality is not great. I ordered these magnets as little stocking fillers and everybody loved them. The quality, ease of ordering and speed of delivery was all excellent. Will definitely use pixa prints again. Quick delivery, packaged in a lovely neat little box which was perfect as they were a gift. Nice quality & just an overall lovely product! Will be ordering again! Arrival etc perfectly fine. Print quality questionable as photo used were of good pixel quality but these appeared slightly grainy although very small. I wish I got the size up as the ones ordered are a bit tooooo small. Overall pretty happy to be fair! Really happy with my magnets, can’t wait to give them for Christmas presents. They make a cute gift and the box they arrive in make it look that extra bit special. Will definitely but more in the future. I shopped around before ordering & found Pixa Prints to be the best value with good reviews. I wasn’t disappointed! I ordered these as a present to my parents with pictures of our beloved dog. From uploading the pictures to adjusting the settings - I couldn’t fault it. The program informs you if the photo is of poor quality prior to ordering which is a bonus as most other companies will let you find out when it’s too late! It’s very easy to use and straight forward. The magnets are of excellent quality with a matte finish so aren’t glossy & in no way do they look tatty. I wasn’t expecting a presentation box either, so that was a nice finishing touch. I ordered the bigger size but now thinking of purchasing some smaller ones to have a varied selection & fill up our fridge with memories. I couldn’t be happier with my item & can’t wait for my parents to open them on Christmas Day! Quick from order to delivery. Very good quality. Perfect little package to delight averyine. 9 different designs and 9 different fonts (if you want to add text, you can potentially split the nine magnets up if you choose to send to family or friends. Bought as surprise present from grandson to his mummy and daddy. Lovely idea, really happy with the quality. Fast delivery. Can't believe how easy it was to upload photos and create the magnets. The email updates and the prompt delivery was the icing on the top. Love my magnets. Nice clear bright images. Came in a nice near box so could be presented as present. Lovely item, photos came out brilliantly on the magnets. Loved the box they arrived in too. Easy to do, quick delivery, very happy with my order. great gift, and really brightened up our fridge! 2 of the photos were not as bright or clear as the others but I'm still happy with the turn out. Bought for a gift and they were really appreciated. Bought for grandparents birthday and they ere over the moon with them. I paid for express delivery and the product came in 2 working days - unheard of for a personalised gift. Very happy. Quick and easy to order with. Ordered this for a friend's birthday and am very happy with the result. I will be ordering more for Christmas presents. I ordered photo magnets, the quality and colour was not good, some of the photos and the magnets are peeling off. Pixa Prints: Sorry to hear of the issue with your magnets. If you would like to contact us we will be more than happy to resolve any issue for you. 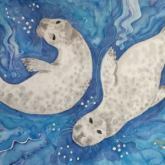 I sell my magnets with photos of my silk painting images and these are going down very well with my customers. Only gripe is those cute little boxes the magnets come in. A tad overpacked maybe? Bought as a birthday gift for my sister, She absolutely loves them. Great photo magnet bought as a personalised souvenir from holiday!! I ordered these for my mum's birthday. So many family photos just stuck on my phone, so this is a great way to make them a bit more permanent! 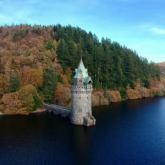 Easy to load and position, you can zoom in but need to make sure the photos are good quality and bright enough as you can't do this in the website. Turnaround was quick and communication was clear. The package arrived safely, in a neat presentation box. Thanks. The photo quality is extremely grainy and colours are poor. Not what i was expecting! Easy to order and fast to arrive. They were presented beautifully. If the quality of the product was actually good then I would of been interested in buying goods more as gifts but I certainly wouldn't recommend them or buy again. My order was a present and it worked a charm. Everyone loves it. Perfect this time and a very quick turnaround!! I was really impressed with the high quality of the photos on the magnets and they arrived promptly and well packaged. Considerably less expensive than other websites without compromising the quality of the product! I will definitely use this company again! Love my magnets, they go on my fridge perfectly and the quality is excellent. Well worth ordering! Perfect way to brighten up the fridge! The 8 x 8cm magnets are easy to personalise and come well presented. This is our 2nd order and we will be purchasing more and would recommend them. I ordered nine fridge magnet sized photos. They all curl up at the edges, not sticking properly. Competitors cut rounded corners to avoid this. The packaging is excellent. Have previously ordered photograph fridge magnets from another company the one I received from pixaprints are far superior in quality and the service was excellent as I received them so quick. The picture did peel off easily on one of the magnets, whether that was just a faulty one or not I assume so. Other than that, the finish was exactly as I'd imagined it to be. Great service as always. Packaged in a nice little box, perfect for the job, and pleasantly surprised at the quality - for the price this must be unbeatable. Happy with my magnets. Very easy to design and efficient service. Easy to design, order came quickly and packaged well. The pictures appear not to be terribly adhesive on the top of the magnet. Caught the edge of one and it lifted slightly. However, I'm still VERY pleased with them!! Very pleased with my fridge magnets. Can't fault them,,,,exactly waht it says on the tin! Really great product and service as always. As expected from pixaprints. The quality is very good and colours are vivid. Will be ordering again in the future. I was really pleased with how the magnets came out, they look brilliant on my Nan's fridge. The images are really clear, the magnets are durable - they have even survived my two year old continuously taking them off of the fridge. Great value. Picture quality is lovely and I'm in love with them. They were easy to make, came quickly and everything was very hassle free! Thank you! I ordered these magnets on the friday evening and recieved them promptly the following wednesday. They came in there own little gift box and the colours are just as vibrant as the original pictures. There was little to no fading which can happen with custom prints sometimes and the overall size and photo quality was fantastic. Would make an excellent gift. The magnets make the best gift! I ordered the 9 pack of magnets as gifts for Father's Day. I included a magnet in each card that I sent out, loved by all! It came in a plain black gift box, so perfect if giving them away as a set! It was my first time using this website and I was really happy with the designing process and the product! Will definitely be ordering again! I ordered these for Father's day and other occasions. I was so impressed with the speed of delivery the packaging. The items were lovely good quality prints I am very happy with them as are the recipient's. Would definitely buy them again and recommend. I'm very happy with product and the efficient of your service and delivery Highly recommended!! I ordered 9 magnets iniatially so that I could see the quality before ordering more. Needless to say I was thoroughly impressed and placed another order the following week. I am building a collage of photos on my fridge so will be ordering again very soon. The quality is far superior to my friends similar product. Magnets are high quality and have a quick delivery time. The magnets arrived quickly and are of amazing quality! Makes a lovely personal present. Nice size in a presentation box. Fast order process and quick delivery. Will order again soon. quick service for a great post wedding gift! I gave photo magnets as a post wedding gift. Arrived quickly in a cute box. The newly weds were happy cus they hadn't printed any pictures from the wedding yet. 4 stars for quality because i noticed small speck of ink that had been chipped off. it was really small so i didnt mind much. Other than that, great product! Really pleased with the magnets. They are exactly as I imagined. Having seen the quality I would definately order the bigger size next time! To save time I would recommend gathering your pictures in a folder before uploading! Great value for money. This makes a simple but excellent gift. Good quality materials used and pictures are spot on. I can't believe what good value these photo magnets are - I purchased them in the sale and have split them up for family stocking fillers. Beautifully packaged in a lovely presentation box. These arrived very quickly. Looked nice and were packaged in a small box. Lovely to be able to display the photos. I Absolutely Love My Magnets! Will be ordering again! I love these magnets and this is my third set i have ordered. Great quality and make fantastic little gifts to make people smile. I will most definitely be ordering again! This is my second order of a set of these magnets and i am just as pleased as i was the first time. Again, great quality item, quick delivery and great updates via email whilst my order was being prepared. I am already planning my third order of these magnets. I ordered a set of these magnets as an alternate way to display some of my photos and i am very pleased with them. The design process was very simple! My product arrived very quickly and i was kept updated via email every step of the way whilst my order was being prepared. The quality of the magnets is great and i will definitely be ordering again as well as recommending to friends!! I happened to stumble upon this website and I fell in love! Such great service and products! Will always be buying from here! Also I live in the USA and products get to me in about 10 days from when I ordered them!